Thank you Andrew [Oko]. Ladies, Gentlemen, and a special welcome to the guests from Windthorst. I suspect that the 'old man' is smiling tonight even more broadly than in his numerous self-portraits: delighted and rightfully proud, pleased with this, his rich and varied exhibition, a forthcoming, well researched, copiously illustrated and revealing catalogue as well as the handsome poster in his beloved prairie colours. A retrospective exhibition is what he wanted. And it travels in Canada which is also what he wanted. From obscurity to, again, national attention. He knew oil paintings had wooden frames with coloured liners. He made, painted and stained his out of locally available lumber. He knew frames in public galleries had engraved metal labels. He made his from trimmed strips of metal and attached them with carpet tacks. Then, with difficulty, he titled them thereon with what appears to be children's crayons. He did not know that artists do not paint their hats. But he did know that artists paint on canvas. What was canvas or canvas-like he painted on: hats, window blinds, the back of masonite. He knew artists contested competitively, participated in group exhibitions, had one man shows and with luck upon occasion sold works. But he was a pioneer farmer isolated in Windthorst. He broke the sod, grew golden wheat, sold booze illegally, patented Rube Goldberg-like inventions. He lived a long and lonely life. He painstakingly painted during cold blue and white, mauve and red winters in his small, cramped one-room shack - his town house. In time Jan has become one of the most influential painters in this province. How? What was the genesis of this rewarding exhibition - one man's intense reflection upon an almost cloistered prairie existence? Here, I hope illustratively, are a few anecdotes about one of these works: These Good Old Thrashing Days, the first of Jan's paintings to enter by direct purchase into this gallery's permanent collection - the first into any public collection. Now, as back then, I consider it to be one of the few major iconic visions in the art of Canada or of the Great Plains. Probably that remarkable and gentle lady Norah McCullough first mentioned him to me as a painter in the southeast of this province. Norah was at that time Western Canada liaison officer of the National Gallery of Canada and, responsibly, knew of his work, presumably from Saskatchewan Arts Board exhibitions and her provincial travels. Then one day Art McKay and Roy Kiyooka pulled out from the cupboard below the gallery stairs where some art rental works were stored an animated, radiant yellow and blue painting: These Good Old Thrashing Days in an obviously homemade frame. Somehow I felt that they were not quite certain of their high opinion of the canvas or were they really testing Bloore as the new, unknown and totally inexperienced gallery director? Shortly thereafter at my request, McKay acting as my cicerone, drove us to Windthorst. We were just two painters, at that moment, who heard he painted, and could we see some of his paintings? "Yes, in town." Out of return crates from Saskatchewan Arts Board exhibitions, Art and I removed such stunning works as The First Saskatchewan Harvest. Convinced that I'd have a fine, if somewhat different, exhibition in the gallery's schedule, this “painter” suddenly became the Director of the Norman Mackenzie Art Gallery and asked him for his first one man show. Fortunately there was no exhibition committee. Unfortunately there was an acquisitions committee. In time such exhibitions became known as "Bloore's Folly" behind his back. But this is the major show Jan Wyers wanted. It is the show he deserved. Now, to buy one of these for the gallery was something else. With luck, perhaps some persuasion, perhaps some undue tolerance and certainly vote trading, These Good Old Thrashing Days passed through a very troubled acquisitions committee one afternoon. Someone thought that the engine dials were incorrect. Someone objected because Wyers had not attended university - note the spelling of thrashing. Can our students do any better? Fortunately, Norah had persuaded Jan to lower his impossible price of $800 to, for the time, a more reasonable $300. Without that intervention the gallery would not have been able to acquire it. 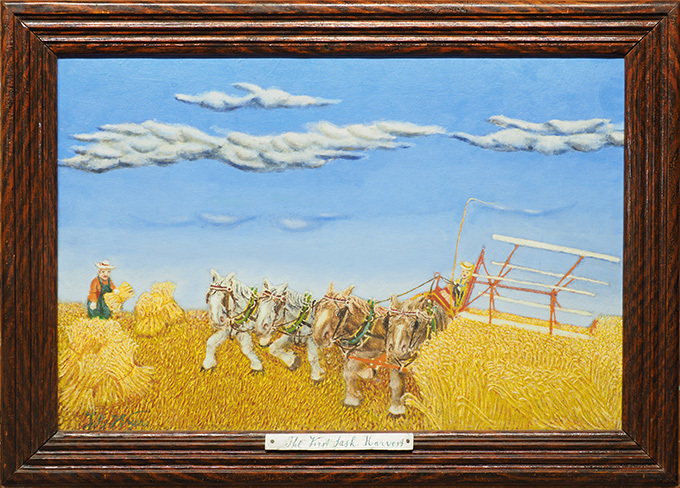 One day a concerned citizen from Ottawa showed me a photograph of a comparable threshing scene implying that Wyers had copied it and therefore the painting was inconsequential. Two points here: ever since the invention of photography, artists have exploited photographic images and, second, Wyers never hid his sources: newspaper clippings, calendars, children's colouring books, skin magazines and the like. Ken Lochhead once remarked, "My God, anyone who can improve upon a calendar can't be all that bad." Another day the proverbial dear little old lady from Lumsden told the director about the events and time recorded in the painting. She rightly loved her memories, as it were, hanging in a gallery. The distinguished late American painter and leader of the famous 1960 Emma Lake Artists Workshop, Barnett Newman, could never understand the gallery's interest in Jan's untutored work. But Jan was a highly intelligent man. 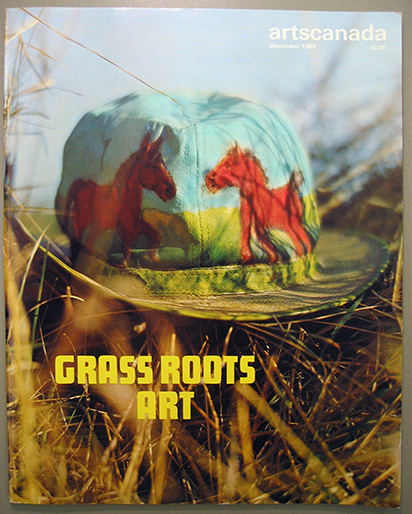 In time his work appeared as the colour cover of Canadian Art magazine. By the way, he was the only artist to have two covers on that former magazine. The other was the Hat. When the gallery had its two probably unadvertized Bloore's Folly exhibitions little or no interest was forthcoming few saw or appreciated his evocations. But now tonight, you hundreds of people are here. His brilliant blue eyes must be sparkling. Dr. Ferdinand Eckhardt, back then Director of the Winnipeg Art Gallery, understood. He hoped to find someone comparable in his province. In fact, he was downright jealous. 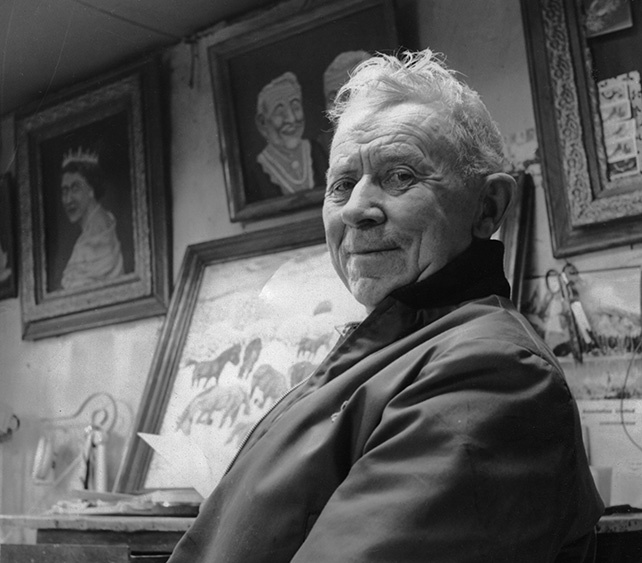 George Swinton, a painter then in Winnipeg, began to purchase; Lochhead bought; Robert Hubbard of the National Gallery made a purchase; others followed; until he ended his days adored and sustained by a much younger and very appreciative generation. Jan would, upon occasion, wander unannounced into the gallery, dressed in a manner sufficiently different from the normal visitor to worry the properly uniformed, beribboned commissionaire. Jan would look intently at everything hanging, not just at works somewhat like his own; based upon representation. Then we would go up to the art school. Claude Breeze, at that time a wild and wildly experimenting student struggling through his brief abstract expressionist phase, recalls to this day Jan's concentrated interest in what he was exploring on canvas. In one article I wrote about Jan's works I noted that he tended to favour sunset scenes, the end of days or seasons: images of thanksgiving. So I asked him one time why so many sunsets? "How else can you get so much red into a painting." I learned from that! Curiously Jan's oral descriptions of what he painted so positively were spoken of as times of absolute, unmitigated hell. Cold, death-threatening winter excursions for fuel. Hot, dry, dusty, noisy, backbreaking long days from before sun-up to thresh grain. 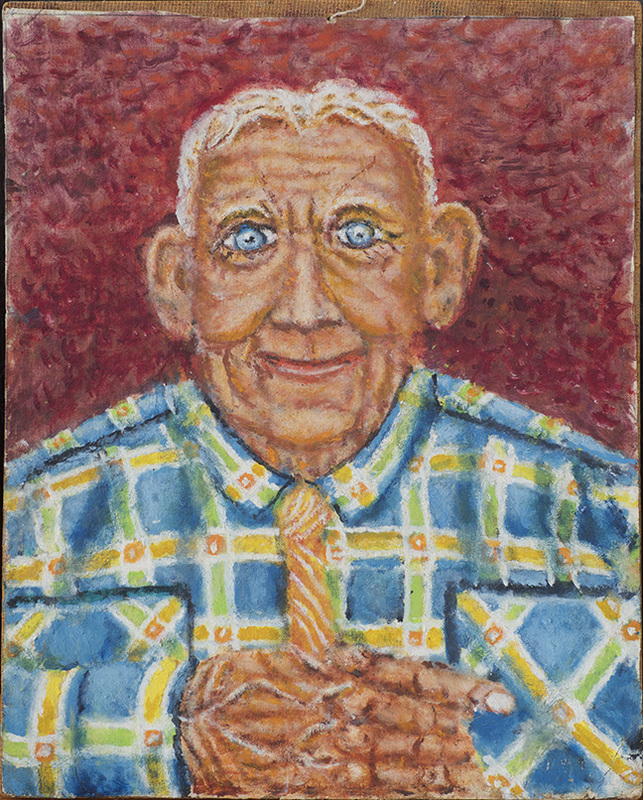 A picture, a painting in Jan's case, is the essence of having lived, filtered through his memory of being. It is my pleasure, it is my honour to declare this exhibition of paintings, a hat and a peanut butter jar by Jan Gerrit Wyers officially open.